Dr Chris Child, Lecturer and Director of City’s Games Technology programmes, welcomes participants. 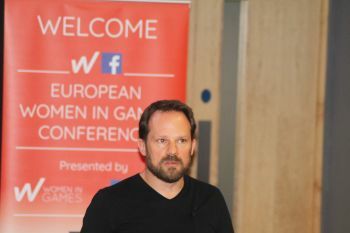 City, University of London, hosted the 2018 European Women in Games Conference on September 11th and 12th. Lecturer and Director of City’s BSc in Computer Science with Games Technology, and MSc in Computer Games Technology, Dr Chris Child, welcomed participants on September 11th and gave them an overview of City’s undergraduate and postgraduate computer games offerings. He also mentioned the success of alumna Caroline Aubry, currently a game developer at Yakuto. The Conference was aimed at “educating, inspiring and helping to stimulate future generations of women”, and comprised keynote speeches, panel discussions and workshops. Fifty speakers and panellists from across the games industry were featured at the Conference including Sharon Hodgson MP, All-Party Parliamentary Group on Video Games.